Small space design is a fun challenge for me. It forces you to be a little more creative with the products you bring into the space, because everything must have a specific function and look great. Umbra and I teamed up to decorate this condo-sized bathroom and here are some of the key pieces that brought it to life. Sometimes hanging towels on hooks just doesn't look good. You end up with a sad blob of terrycloth on your small bathroom footprint. The HUB ladder is the ideal spot to hang your towel in a decorative, aesthetically pleasing way that is intentional. It's also a handy spot to hang your favourite magazine or outfit you are considering wearing. The simple airy design of this MAGINO stool is the main reason I find it so fitting for a shower. 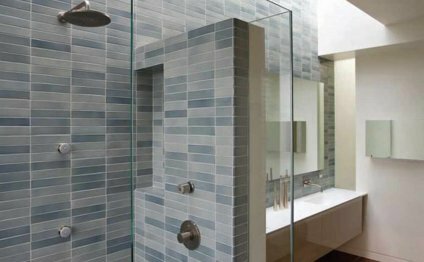 Condo showers aren't typically all that large, so visually you don't want anything too heavy or clunky in there. Having a spot to sit and shave your legs is a game changer! My goal with this bathroom was to create something unconventional and decorate with pieces you may not otherwise find in a bathroom, while still maintaining practicality and function. The best of these is the CONCEAL floating bookshelf. Why not give yourself (and your guests) the opportunity to flip through a great book while doing their 'royal deed'? It's also a nice way to store your favourite books in a location you will see every day. We all know books have a tendency to collect dust. Another item that I incorporated in the design was the SLIDER photo display. Typically this design is used to display photos on a desk, but I love having it on the wall to display photos, and more importantly to get essential toiletries off the counter. It helps to keep your bathroom products organized, which is key when storage space is limited. SLIDER when used this way also becomes a shelf where I can add a touch of green. The mini rose bush has been potted into one of Umbra's TOUCH toothbrush holders. I love when a design has an interactive element, it's nice to have a space that lives with you instead of just looking pretty. I used TALK bubble magnets that you usually see on a fridge to allow your friends and family to leave funny or loving messages. This is a full proof method of ensuring the bathroom experience is a pleasant one! BUDDY hooks are used to hang small hand towels. I just love the playful element both these designs add to the space. We all know the bathroom is one room you can't avoid visiting throughout your day, so why not make sure it meets your needs aesthetically and functionally? In my designs I challenge myself to use items in new and creative ways to benefit my clients' lifestyles, and it was a joy to be doing so with the products at Umbra which are already so versatile and beautifully designed.